In vertebrates, the inner ear is comprised of the cochlea and vestibular system, which develop from the otic vesicle. This process is regulated via inductive interactions from surrounding tissues. Tbx1, the gene responsible for velo-cardio-facial syndrome/DiGeorge syndrome in humans, is required for ear development in mice. Tbx1 is expressed in the otic epithelium and adjacent periotic mesenchyme (POM), and both of these domains are required for inner ear formation. To study the function of Tbx1 in the POM, we have conditionally inactivated Tbx1 in the mesoderm while keeping expression in the otic vesicle intact. Conditional mutants (TCre-KO) displayed malformed inner ears, including a hypoplastic otic vesicle and a severely shortened cochlear duct, indicating that Tbx1 expression in the POM is necessary for proper inner ear formation. Expression of the mesenchyme marker Brn4 was also lost in the TCre-KO. Brn4-;Tbx1+/-embryos displayed defects in growth of the distal cochlea. To identify a potential signal from the POM to the otic epithelium, expression of retinoic acid (RA) catabolizing genes was examined in both mutants. Cyp26a1 expression was altered in the TCre-KO, while Cyp26c1 showed reduced expression in both TCre-KO and Brn4-;Tbx1+/- embryos. These results indicate that Tbx1 expression in the POM regulates cochlear outgrowth potentially via control of local retinoic acid activity. The vertebrate inner ear develops from the otic vesicle, which forms via invagination of specified ectodermal cells adjacent to the hindbrain. A crucial phase in development of the sensory structures of the inner ear occurs as the otic epithelium acquires regional identity along its axes. Classic explant experiments by developmental biologists first suggested that otic patterning occurred in response to signals from surrounding tissues, and recent work has revealed much of the molecular basis of these interactions [for review see [1–3]]. For example, genetic studies in the mouse showed that genes expressed along the dorsoventral axis of the otic vesicle are induced by signals from the roof plate and floor plate of the neural tube [4, 5]. Specifically, members of the Wnt family of morphogens, secreted from the dorsal hindbrain, regulate the expression of dorsal genes required for development of vestibular structures, while Sonic hedgehog (Shh) secreted from the ventral hindbrain and notochord is necessary for the expression of ventral genes that promote cochlear formation. Proper patterning of the otic vesicle is essential for subsequent growth and morphogenesis of the inner ear. In the ensuing stages of development, genes expressed within the otic vesicle are known to direct formation of the cochlea and vestibular structures. However, surrounding tissues continue to play an important role. Shh promotes outgrowth of the cochlear duct via activation of Gli2 and Gli3 in the otic vesicle and surrounding mesenchyme . In addition, periotic mesenchyme (POM) cells condense around the otic vesicle and undergo chondrogenesis to give rise to the otic capsule, which surrounds and protects the inner ear sensory structures. The close association between the POM and the otic epithelium suggests that epithelial-mesenchymal interactions exist between these two tissues, and disruption of these interactions could lead to defects in inner ear formation. Indeed, multiple mouse mutants indicate that signaling from the epithelium to the mesenchyme is crucial for capsule formation and is dependent upon members of the Fibroblast growth factor (Fgf) and Bone morphogenic protein (Bmp) gene families [7–9]. Evidence supporting a requirement for signals from the POM to the otic vesicle during inner ear formation also exists. Explant experiments demonstrated that cultured otic vesicle epithelium failed to form differentiated hair cells in the absence of surrounding POM cells [10, 11]. Furthermore, mice null for Brn4, a Pou-domain transcription factor expressed in the POM but not the otic vesicle, display a reduction in the number of turns of the cochlea . These data indicate a cell nonautonomous role for the POM during inner ear development. TBX1 is a member of a large family of transcription factors called T-box genes that have important roles in embryonic development. Haploinsufficiency of TBX1 in humans is associated with velo-cardio-facial syndrome/DiGeorge syndrome (VCFS/DGS), which causes sensorineural hearing loss in approximately 10% of patients . In the mouse, Tbx1 is essential for the development of the inner ear, evidenced by the lack of both auditory and vestibular structures as well as an expansion of the cochleovestibular ganglion (CVG) in Tbx1 null mutants [14, 15]. During embryogenesis, Tbx1 is expressed in both in the otic vesicle and in the ventral POM cells that lie between the source of Shh and the otic vesicle. Conditional ablation of Tbx1 expression in the otic vesicle results in an inner ear phenotype identical to that of Tbx1-/- embryos, indicating a tissue autonomous role for Tbx1 in otic vesicle patterning . However, the POM domain of Tbx1 was also shown to be essential for normal outgrowth of the cochlear duct, supporting a role for the mesenchyme in morphogenesis of the inner ear epithelium . These data support a model in which cochlear outgrowth is regulated by Shh signaling from the ventral midline via genes expressed in the POM and the otic vesicle. Expression of both Tbx1 and Brn4 in the POM is responsive to Shh signaling, and is lost in Shh null mutants . In contrast, Tbx1 expression in the otic vesicle is unaffected in Shh-/- embryos [4, 18]. This indicates that the mechanism by which Shh regulates cochlear duct outgrowth may be distinct from its regulation of otic vesicle patterning. To further characterize the role of the POM in inner ear morphogenesis and identify genes downstream of Tbx1 and Brn4 signaling to the otic vesicle, we generated mutants in which Tbx1 was specifically ablated in the mesoderm. 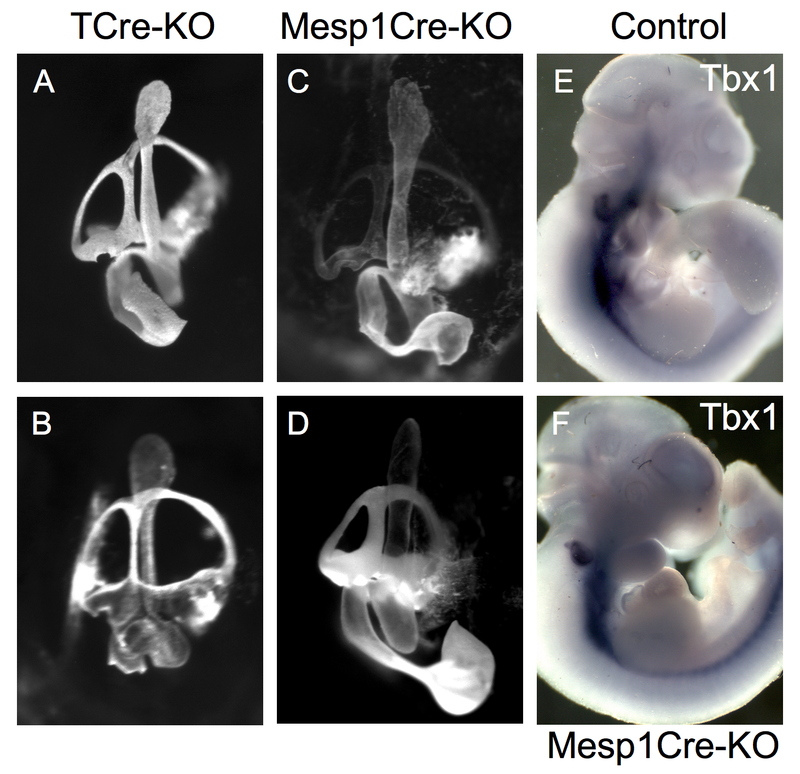 T-Cre mediated conditional mutants (TCre-KO) displayed severe defects in growth and coiling of the cochlear duct, similar to a comparable Tbx1 mutant using an alternative Cre driver . 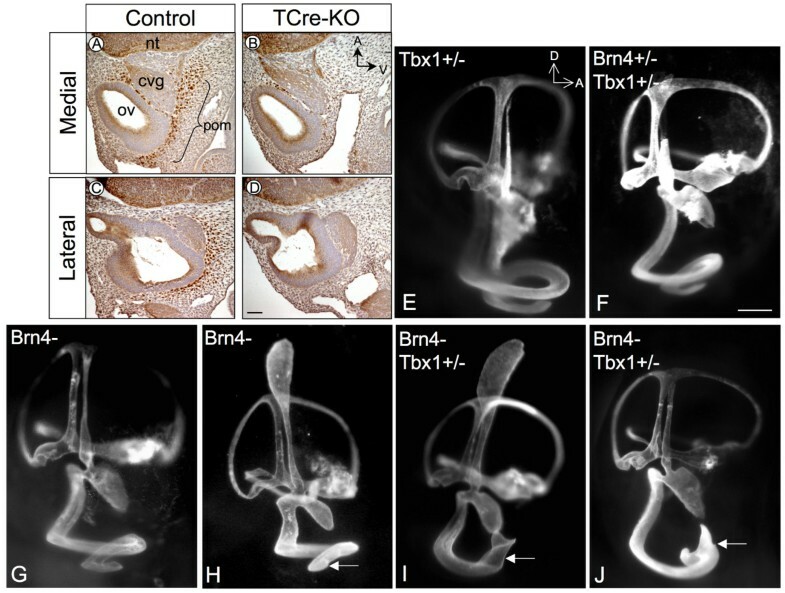 To determine the molecular basis for these defects, Brn4 protein expression was examined in TCre-KO mutants, since adult Brn4-;Tbx1+/- mice also display a reduction in the number of cochlear turns . Expression of Brn4 was lost in the POM in conditional mutants, and Brn4-;Tbx1+/- embryos exhibited similar but less severe defects in cochlear coiling compared to TCre-KO embryos. Further, expression of retinoic acid (RA) metabolizing enzymes was examined because RA has been implicated in the control of epithelial-mesenchymal interactions . We identified changes in the expression of RA catabolizing enzymes Cyp26a1 and Cyp26c1 in both TCre-KO and Brn4-;Tbx1+/-mutants. These results support a role for Tbx1 and Brn4 in regulating levels of RA in the POM required for inner ear morphogenesis. To assess the role of Tbx1 in the POM, conditional mutants were created in which Tbx1 expression was ablated in all mesodermal tissues. This mutant was generated by crossing mice carrying the Tbx1 flox allele with T-Cre transgenic mice to obtain T-Cre;Tbx1flox/- embryos (TCre-KO). To confirm that Cre activity was restricted to the mesoderm, T-Cre mice were crossed with the ROSA26 reporter strain  and offspring were analyzed for LacZ expression. At E9.0 and E10.5, Cre activity was detected in the mesodermal cells surrounding the otic vesicle and not in the otic epithelium (Additional file 1, Fig. S1A, B). Analysis of Tbx1 expression at E9.5 and E10.5 in TCre-KO embryos revealed reduced Tbx1 expression in the mesoderm compared to control (Tbx1+/-) embryos, while Tbx1 expression in the otic vesicle was unaffected (Additional file 1, Fig. S1C-F). Analysis of TCre-KO embryos using an anti-Tbx1 antibody (Ab) confirmed that the residual Tbx1 expression was not due to an aberrant transcript (data not shown). These data indicated that the TCre-KO mutant was a mesodermal hypomorph. Supporting this, TCre-KO mutants displayed a phenotype that closely matched another Tbx1 mesodermal conditional mutant generated using the Mesp1-Cre driver . Analysis of the inner ear of both mutants by paint-fill (n = 6) revealed slightly variable but overlapping phenotypes, however the most severely affected inners ear of TCre-KO embryos displayed a shorter cochlear duct than Mesp1Cre-KO mutants (Additional file 2, Fig. S2A-D). Mesp1Cre-KO mutants were also found to be hypomorphic following examination of Tbx1 expression (Additional file 2, Fig. S2E-F). Thus, mesodermal expression of Tbx1 in the TCre-KO mutant appears to be reduced to a level sufficient to isolate the role of Tbx1 in the POM. Examination of the membranous labyrinth of TCre-KO embryos revealed multiple defects. The cochlea normally forms one and three quarter turns in the mouse by E15.5 (Fig. 1A). At this stage, 4 of 6 TCre-KO embryos displayed a severely shortened cochlea with only the most basal, or hook region, present (Fig. 1D, Additional file 2 – Fig. S2B). Two TCre-KO embryos displayed an abnormal but slightly longer cochlea (Additional file 2, Fig. S2A). The vestibular system exhibited consistent mild hypoplasia, however the semicircular canals, utricle and saccule were always present. In addition, the endolymphatic duct and sac were enlarged (Fig. 1D), reminiscent of Mondini dysplasia. Histological sections through the inner ear of TCre-KO embryos at E17.5 (n = 8) confirmed the cochlear defects seen by paint-fill and revealed a lack of a recognizable organ of Corti (Fig. 1B and 1E). This is consistent with the sensory organ defects reported in Mesp1Cre-KO mutants, which displayed a lack of hair cells in the medial and apical cochlea evidenced by the absence of Myosin 7a expression . In addition, TCre-KO embryos displayed abnormalities in the structure of the otic capsule (Fig. 1B, E). Interestingly, the capsule surrounding the vestibular system appeared relatively unaffected, while the cochlear capsule was severely malformed. This was easily appreciated upon bone and cartilage staining of TCre-KO embryos (n = 5; Fig. 1C, F). The capsule malformations may be due to defects in the POM, or secondary to the malformations of the membranous labyrinth. Inner ear defects in the TCre-KO. 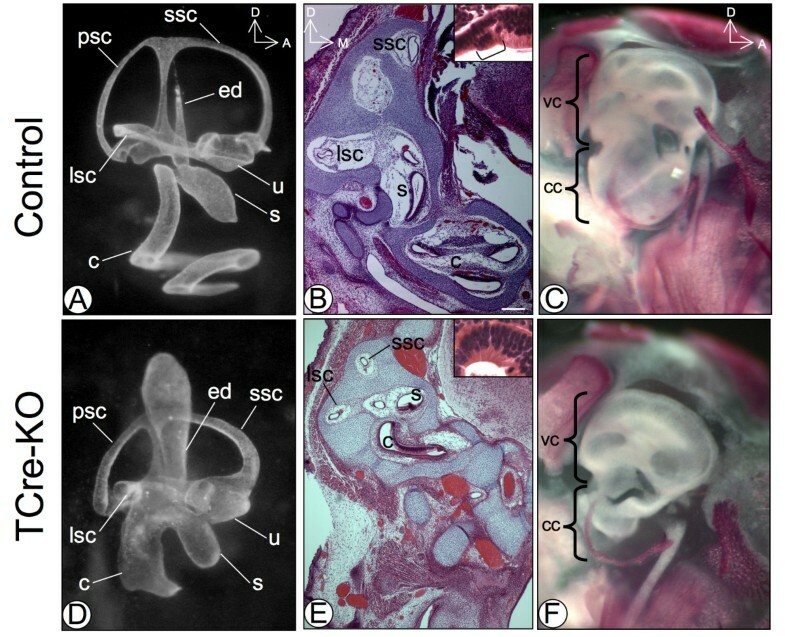 At E15.5, a paint-filled inner ear of a control embryo (A) displays a cochlea (c) consisting of 1.75 turns and a vestibular system consisting of the saccule (s), utricle (u), endolymphatic duct (ed) and lateral, posterior and superior semicircular canals (lsc, psc, ssc). A transverse section though the inner ear of an E17.5 control embryo (B) displays the sensory structures of the ear with an intact organ of Corti (bracketed in inset) and the surrounding capsule. Bone and cartilage staining of an E17.5 control embryo (C) reveals the vestibular capsule (vc) and cochlear capsule (cc). Paint-fill of the inner ear of an E15.5 TCre-KO embryo (D) reveals malformations of both the auditory and vestibular system. The cochlea is severely shortened, the vestibular structures are hypoplastic and the endolymphatic duct (which did not completely fill with paint in (A)) is enlarged. At E17.5, the inner ears of TCre-KO embryos (E) are malformed and display only the hook region of the cochlea (c) with no recognizable organ of Corti (inset), and hypoplastic semicircular canals (lsc, ssc). Bone and cartilage staining (F) reveals a malformed cochlear capsule (cc), while the vestibular capsule (vc) appears relatively unaffected. Scale bar in B is 200 μm. Ventral structures of the inner ear in TCre-KO embryos were more severely affected than dorsal structures, consistent with the localization of Tbx1 expression in the ventral POM during inner ear morphogenesis (Additional file 1, Fig. S1C). Because Shh is known to regulate the expression of ventral markers in the otic vesicle, we speculated that patterning of the dorsoventral axis might be abnormal in TCre-KO embryos. Analysis of ventral sensory markers Pax2 and Otx1 and dorsal markers Bmp4 and Dlx5 revealed no changes in expression in the otic vesicle of TCre-KO embryos versus controls at E10.5 (n = 3, Fig. 2A–D). This suggests that early dorsoventral patterning occurs normally in the absence of mesodermal Tbx1. In addition, expression of Gata3, a lateral marker, as well as anterior markers NeuroD, Fgf10, Fgf3 and Lnfg, was unchanged in TCre-KO mutants compared to controls at E10.5 (n = 3, Fig. 2E–J). 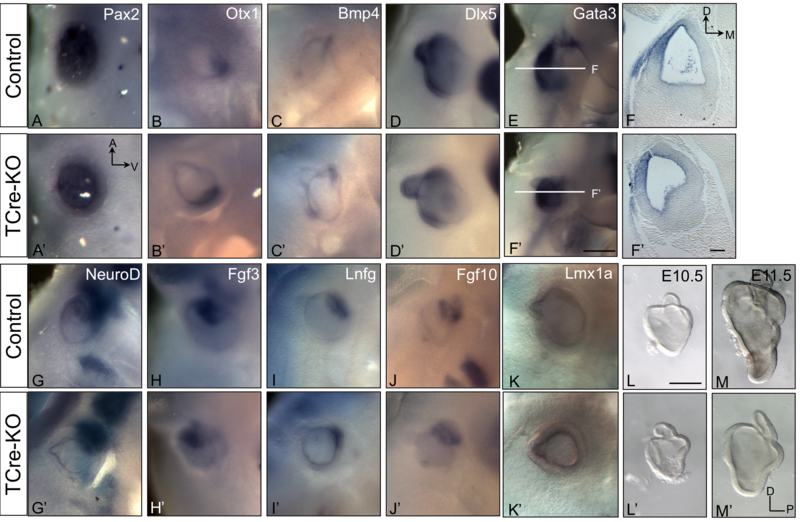 Lmx1a, which has been shown to be required for development of the endolymphatic duct , is also unchanged in TCre-KO embryos at this stage (n = 3, Fig. 2K, K'). This indicates that early otic patterning and formation of the CVG are likely unaffected in TCre-KO mutants. This is consistent with the reported normal expression of neurogenic markers Isl1 and Ngn1 in Mesp1Cre-KO embryos at the same stage . Otic markers and vesicle morphology are unaffected at E10.5 in TCre-KO mutants. Expression of sensory (A-F) and neurogenic (G-J) markers are unchanged in TCre-KO embryos compared to controls at E10.5. Ventral markers Pax2 and Otx1, as well as dorsal markers Bmp4 and Dlx5 are normal in TCre-KO mutants (A'-D'). Gata3 expression in the lateral otic vesicle is also unchanged in the TCre-KO, visualized in cross sections through the otic vesicle (F'). Expression of anterior markers NeuroD, Fgf3, Lnfg and Fgf10 display normal expression in the CVG in both mutants (G'-J') and controls (G-J). Expression of Lmx1a, which marks the growing endolymphatic duct, is also unchanged (K, K'). Microdissected otic vesicles are shown at E10.5 (L, L') and E11.5 (M, M'). At E10.5, the morphology of the otic vesicle in control (L) and TCre-KO (L') embryos is similar. By E11.5, the otic vesicles of TCre-KO embryos (M') are malformed and hypoplastic compared to controls (M). Scale bar in L is 250 μm and applies to all panels except (E, E') and (F, F'). Scale bars in E' and F' are 200 μm. To ascertain the stage in which changes in gene expression might first appear in the TCre-KO mutants, we identified the onset of morphological defects in mutant embryos. At E10.5, the otic vesicles of TCre-KO embryos were indistinguishable in overall size and shape from control otic vesicles (n = 4; Fig. 2L, L'), consistent with the lack of expression changes of molecular markers. However, at E11.5 TCre-KO embryos exhibited a malformed and hypoplastic otic vesicle that was easily distinguished from controls (n = 9; Fig. 2M, M'). Thus, physical defects in the otic vesicles TCre-KO embryos do not appear until after axis determination is complete, consistent with a role for Tbx1 expression in the POM in otic patterning. Tbx1 has previously been shown to regulate the mitotic activity of the otic epithelium , indicating the abnormal inner ears seen in TCre-KO embryos may be due to defects in cell proliferation. To test this hypothesis, mutant and control embryos were analyzed at E11.5 using an antibody to the M-phase marker phospho-Histone 3 (Fig. 3A, C). This stage was chosen because it corresponds with the onset of morphological defects in the otic vesicle of TCre-KO embryos. Proliferating cells were counted in transverse sections through the entire otic vesicle of mutant and control embryos (n = 6). A significant reduction in proliferating cells was apparent (p = 0.011, Student's t-test), with an average of 25.9 and 42.7 positive cells per section in mutant versus control, respectively (Fig. 3E). Proliferating cells were also counted in the dorsal and ventral halves of the otic vesicle, and both of these regions displayed a decrease in proliferation in mutant compared to control embryos (Fig 3E, n = 6, p = 0.001 dorsal and p = 0.038 for ventral). Interestingly, no significant difference in proliferation was observed when dorsal and ventral halves of the TCre-KO mutants were compared directly (Fig. 3E). This suggests that cell proliferation is reduced broadly throughout the entire otic vesicle, as opposed to a localization of defects in the dorsal or ventral epithelium. We next tested whether proliferation of POM cells was affected in TCre-KO mutants. At E11.5, the cells of the POM have only just begun to condense around the otic vesicle and have not yet formed a well-defined population. We assessed cell proliferation in the POM of TCre-KO embryos by counting positive cells in an arbitrarily defined region of mesenchyme surrounding the otic vesicle. Proliferation was found to be unaffected in TCre-KO embryos compared to controls (n = 4, 77.3 and 74.6 positive cells per section in mutant and controls, respectively), suggesting that Tbx1 does not exert a tissue autonomous affect on proliferation of POM cells at this stage. TCre-KO embryos exhibit defects in cell proliferation and survival. Transverse sections at E11.5 of control (A) and TCre-KO (C) embryos labeled for mitotic cells using an Ab against phospho-Histone 3. TCre-KO embryos display a decrease in cell proliferation in the otic epithelium compared to controls upon quantification (E). Proliferation was reduced in both dorsal and ventral regions of the otic vesicle, but not in the POM. For the dorsal otic vesicle, 11.2 and 21.4 positive cells were observed for mutant and control, respectively, while 14.0 and 22.4 positive cells were observed observed for the ventral otic vesicle. TCre-KO embryos exhibit an increase in apoptosis at E11.5, identified by an Ab to active Caspase 3 (B, D). Arrow and bracketed area in (d) mark apoptotic cells. Quantification of apoptotic cells in control and mutant otic epithelium is shown (F). Asterisks indicate significant difference (* = p < 0.05, ** = p < 0.01, one-tailed, unpaired Student's t-test). Error bars represent 95% confidence interval. Boxed areas are magnified in a-d. Scale bar indicates 200 μm in (A), and 50 μm in (a). We next asked whether the otic epithelium of TCre-KO embryos displayed changes in cell survival using an antibody to the apoptotic marker activated Caspase 3. At E11.5, a significant increase in cell death was observed in the otic vesicle of TCre-KO embryos compared to controls (p = 0.035, Student's t-test, n = 4), with an average of 7.02 and 4.13 apoptotic cells per section in mutant versus control embryos, respectively (Fig. 3B, D, F). This indicates that Tbx1 expression in the POM has a modest affect on survival of the otic epithelium. Interestingly, apoptotic cells were not observed in the POM of TCre-KO or control embryos at this stage (Fig. 3B, D). These data suggest that Tbx1 has a role in regulating paracrine signaling to the otic epithelium prior to capsule formation. A previous study showed that protein expression of Brn4, a marker for the POM, was lost in Tbx1 null mice but present in conditional mutants in which Tbx1 was ablated in the otic vesicle and pharyngeal endoderm . This suggested that the POM domain of Tbx1 regulates Brn4 or proliferation of Brn4-expressing cells. To test this hypothesis, Brn4 expression was examined in TCre-KO embryos and was indeed reduced in the POM at E10.5 (Fig. 4A–D, n = 3). Brn4 expression is reduced in the POM of TCre-KO embryos, and Brn4 - ; Tbx1 +/- embryo display defects in cochlea coiling. 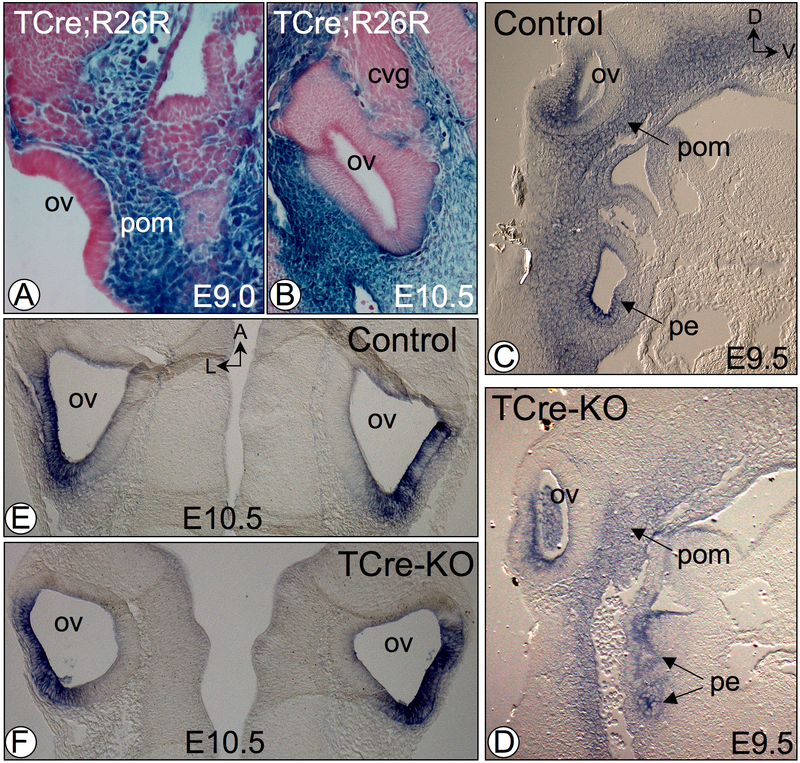 Sagittal sections of control (A) and TCre-KO (B) embryos at E10.5 stained with an Ab against Brn4. Expression in the POM is lost in TCre-KO embryos, however neural tube (nt) expression is unaffected. Brn4-;Tbx1+/- embryos display a shortened cochlear duct. Lateral views of paint-filled membranous labyrinths at E15.5–E16.0 of Tbx1+/- (E), Brn4+/-;Tbx1+/- (F), Brn4-(G, H), Brn4-;Tbx1+/- (I, J). The fully developed mouse cochlea normally completes 1.75 turns, and all inner ears of Tbx1+/- mutants and Brn4+/-;Tbx1+/- exhibited normal cochlear growth (E, F). The majority of Brn4- mutant inner ears also displayed a normal cochlea (G), while 20% displayed a slightly shortened cochlea (H). All inner ears Brn4-;Tbx1+/- mutants exhibited a malformed cochlea that failed to form a second turn and instead displayed abnormal twisting or bifurcation (I, J). Arrows point to the cochlear duct in H-J. The endolymphatic sac in E, F, G and J was present but did not fill with paint. cvg, cochleovestibular ganglion; ov, otic vesicle; nt, neural tube; pom, periotic mesenchyme. Scale bar in D is 200 μm, scale bar in F is 350 μm. We recently established a genetic interaction between Tbx1 and Brn4 in the inner ear, as adult Brn4-;Tbx1+/- mice display a significant reduction in the number of cochlear turns compared to Brn4- or Tbx1+/- mice alone . To determine the morphological basis of this interaction, the membranous labyrinth of compound mutants of Tbx1 and Brn4 was analyzed by paint-fill experiments. At E15.5, all Tbx1+/- (n = 6) and Brn4+/-;Tbx1+/- (n = 6) embryos exhibited grossly normal inner ear structures (Fig. 4E, F). Furthermore, the majority of Brn4- mutants (Brn4 is X-linked) also exhibited normal inner ears with a completely coiled cochlea (8 out of 10 inner ears examined; Fig. 4G). Two Brn4- mice displayed a slightly shortened cochlea of 1.5 turns (Fig. 4H). We then asked whether the addition of a single Tbxl null allele would affect the penetrance of the Brn4 null phenotype. All Brn4-;Tbx1+/- mutants (n = 10) exhibited one cochlear turn followed by abnormal twisting and termination of the cochlear duct (Fig. 4I). In some cases, the cochlear duct bifurcated before terminating prematurely (Fig. 4J). These data indicate that Tbx1 may function in parallel with Brn4 to regulate a common downstream pathway important for cochlear growth. The defects seen in TCre-KO and Brn4-;Tbx1+/- embryos suggest a non-autonomous role for Tbx1 and Brn4 in the POM during cochlear outgrowth. Because both genes are nuclear transcription factors, they may act on a common downstream target that signals to the otic vesicle. One likely candidate is retinoic acid (RA), which is known to be important for epithelial-mesenchymal interactions during inner ear development . Tbx1-/- embryos carrying a RA response element reporter construct  exhibited increased RA activity in the pharyngeal mesenchyme, including the POM, at E9.5 and E10.5 . Further, expression of Cyp26 enzymes that catabolize active RA was reduced in these same tissues in Tbx1-/- embryos [26, 27]. We hypothesized that the inner ear defects present in the TCre-KO mutant might be due to abnormal RA metabolism caused by a reduction of Cyp26 gene expression. Of the three Cyp26 genes that catabolize RA, both Cyp26a1 and Cyp26c1 are co-expressed with Tbx1 in the POM . To test if mesenchymal Tbx1 regulates these genes, expression analysis was performed on TCre-KO embryos. Cyp26a1 and Cyp26c1 are expressed in similar patterns in the inner ear . Both genes are restricted to the lateral and ventral POM at E10.5 and E11.5, which corresponds to the mesenchymal cells adjacent to the developing cochlear duct (Fig. 5B, F, I, J, M, N). Cyp26c1 is also found in the lateral wall of the cochlear duct epithelium (Fig. 5M, N). The expression of these genes in the POM significantly overlaps with Tbx1 expression at these stages (compare Additional file 2, Fig. S2E to Fig. 5A, E). At E10.5 in TCre-KO embryos, Cyp26a1 expression was missing from the lateral POM and appeared to be shifted to a more ventral position (Fig. 5A, C, n = 3). Transverse sections through the otic vesicle confirmed the absence of Cyp26a1 expression in the lateral POM (Fig. 5B, D). 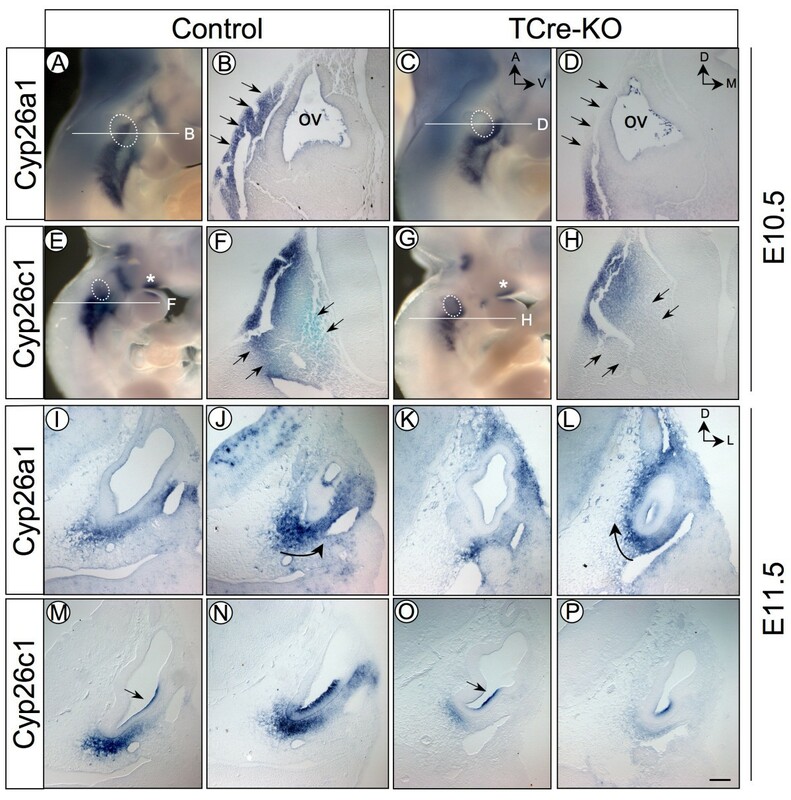 Further, expression of Cyp26c1 was strongly reduced in the mesenchyme at E10.5 in TCre-KO mutants, while first arch expression was unaffected (Fig. 5E, G, n = 3). The reduction of Cyp26c1 expression is particularly evident in the POM immediately posterior to the otic vesicle (Fig. 5F, H). Expression of Cyp26b1, which is predominately in the dorsal POM, was unchanged in TCre-KO mutants (data not shown). Expression of Cyp26 genes is altered in TCre-KO embryos. Cyp26a1 and Cyp26c1 expression detected by whole mount in situ hybridization at E10.5 in control and TCre-KO embryos (A-H). The plane of section in B, D, F and H is marked in A, C, E, and G, respectively. Cyp26a1 expression in the lateral POM (arrows in B) is absent in TCre-KO mutants (arrows in D), and appears shifted to a more ventral position (compare A an C). Cyp26c1 expression is strongly reduced in the mesenchyme of TCre-KO mutants (compare F and H), but 1st arch expression is unaffected (asterisk in E and G). At E11.5, Cyp26a1 expression remains shifted medially in TCre-KO mutants compared to controls (I-L), especially in posterior sections through the growing cochlear duct (arrows in J and L). Cyp26c1 is strongly reduced in the ventral POM at this stage (M-P), but remains present in the otic epithelium (arrows in M and O). A dotted circle outlines the otic vesicle (ov) in A, C, E, G. Scale bar in P is 200 μm and applies to all panels except A, C, E, G.
The shift of Cyp26a1 expression from a lateral to a medial position was also apparent at E11.5 in TCre-KO embryos compared to controls (Fig. 5I–L, n = 3). This change in expression was more pronounced in posterior sections through the developing cochlear duct (Fig. 5J, L). 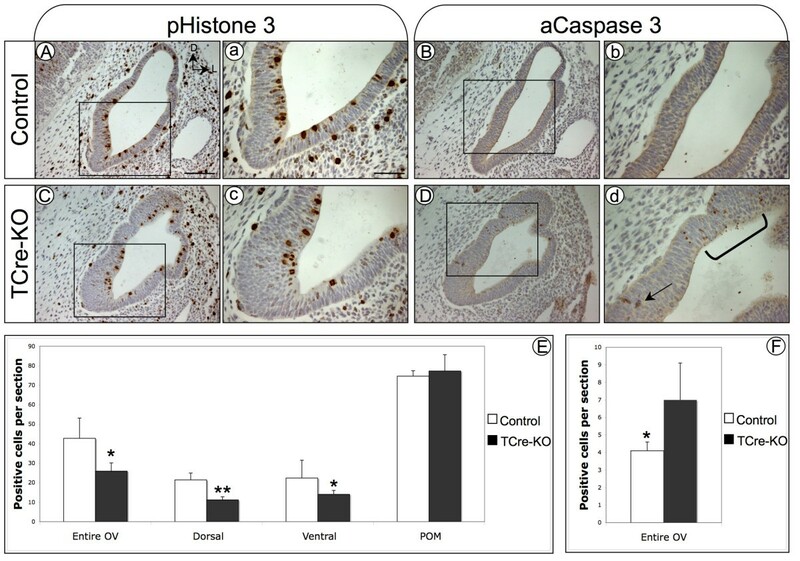 Also at this stage, Cyp26c1 expression was strongly reduced in the ventral POM of TCre-KO mutants, while expression in the cochlear duct epithelium was unaffected (Fig. 5M–P, n = 3). This data suggests that Tbx1 acts upstream of two Cyp26 genes expressed in the medial and ventral POM. To further test this hypothesis, expression of Cyp26a1 and Cyp26c1 was analyzed in Tbx1+/-, Brn4- and Brn4-;Tbx1+/- embryos. If Brn4 and Tbx1 both act upstream of a common target in the POM, then Brn4-;Tbx1+/- embryos might display a similar change in Cyp26a1 and Cyp26c1 expression as seen in TCre-KO embryos. In Tbx1+/-, Brn4- and Brn4-;Tbx1+/- embryos at E12.5, expression of Cyp26a1 was unchanged (data not shown). However, Cyp26c1 expression was reduced in the ventral POM of Brn4-;Tbx1+/- embryos compared to Tbx1+/- and Brn4- embryos (Fig. 6A–C, E–F). Further, Cyp26c1 is co-expressed with Tbx1 in the ventral POM surrounding the cochlear duct at this stage (Fig. 6A, D). Together with the results seen in TCre-KO mutants, these data indicate that Cyp26c1 is more sensitive to Tbx1 dosage than Cyp26a1. In addition, they suggest that Tbx1 and Brn4 act in concert to regulate RA activity in the POM, consistent with increased mesenchymal RA signaling observed in Tbx1-/-embryos. Cyp26c1 expression is reduced in Brn4 - ; Tbx1 +/- embryos. Transverse sections through the cochlear duct (c) probed for Cyp26c1 (A-C, E-F) or Tbx1 (D) in Tbx1+/-, Brn4- and Brn4-;Tbx1+/- embryos at E12.5. 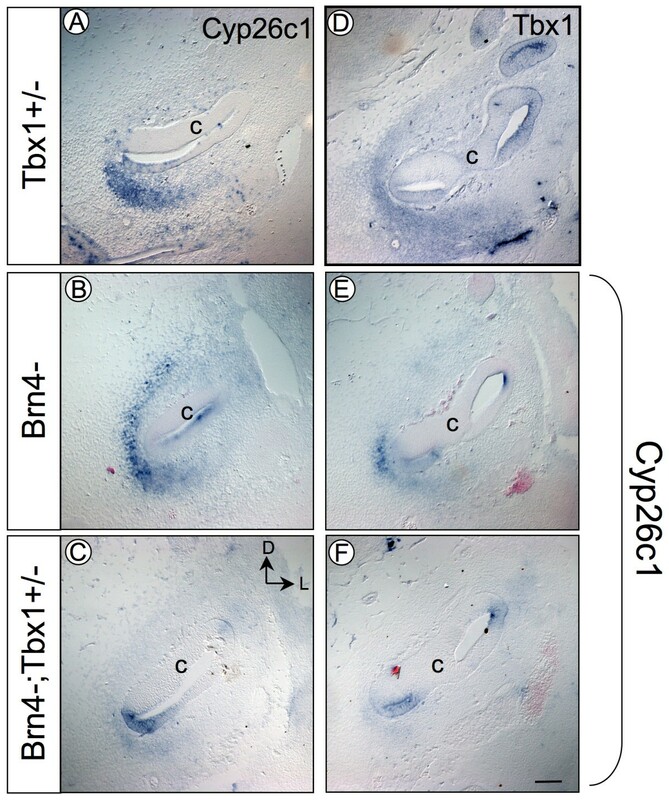 Cyp26c1 expression is reduced in the ventromedial POM surrounding the cochlear duct of Brn4-;Tbx1+/- embryos (C and F) compared to Tbx1+/- (A) and Brn4- (B and E) embryos. Tbx1 is expressed in this same region (D) and overlaps with Cyp26c1 expression. Expression of Cyp26c1 in the otic epithelium is unaffected in Brn4-;Tbx1+/- embryos. Scale bar is 200 μm. During inner ear development, Tbx1 is expressed in the ventral mesenchyme cells that surround the otic vesicle and give rise to the cochlear capsule. TCre-KO embryos displayed malformations in both the otic capsule and membranous labyrinth, with ventral structures most severely affected. These results indicate that Tbx1 expression in the POM is essential for development of the epithelial structures of the inner ear. There are two potential explanations for this phenotype. It is possible that mesodermal Tbx1 is required for proper formation of the otic capsule, and abnormal condensation or differentiation of the POM prohibits proper outgrowth and coiling of the cochlea. An alternative, yet not mutually exclusive, explanation is that ablation of mesodermal Tbx1 disrupts signaling to the cochlear epithelium, altering the expression of genes critical to the formation of the membranous labyrinth and subsequently the otic capsule. This latter scenario is supported by the presence of physical malformations and a decrease in cell survival in the otic vesicle of TCre-KO embryos prior to capsule formation. We provide evidence that signaling to the otic epithelium occurs via RA, and propose that proper control of RA activity by the POM domain of Tbx1 is required for normal development of the inner ear. The data from this and previous studies support distinct and independent roles for Tbx1 in the otic vesicle and POM, despite the close proximity of these tissues during development. Expression of Tbx1 in the otic vesicle functions just after induction of the otic placode, and is required for specification of neural versus sensory cell fate. This is accomplished via inhibition of neurogenic genes such as Ngn1 and NeuroD, while promoting expression of sensory markers such as Otx1 and Bmp4 [14, 16]. In contrast, expression of Tbx1 in the POM does not appear to be required until after the major patterning events of the inner ear have occurred and the otic vesicle has acquired its axial identities. Indeed, sensory and neurogenic markers are expressed normally in the otic vesicle of TCre-KO embryos at E10.5. Due to the hypomorphic nature of the TCre-KO allele, we cannot exclude the possibility that sufficient Tbx1 expression exists at earlier stages to obscure a subtle patterning phenotype. However, lack of patterning defects in Mesp1Cre-KO using a different floxed allele [17, 24] embryos argues against this alternative. We have previously identified a genetic interaction between Tbx1 and Brn4 in the POM [16, 19]. Mice null for Brn4 display a reduction in the number of cochlear turns, although the penetrance of this phenotype is incomplete and is less severe than the cochlear defects observed in the TCre-KO mutant . Brn4 protein expression was reduced in TCre-KO embryos at E10.5, indicating that Tbx1 may regulate transcription of Brn4. Alternatively, it is possible that Brn4 expression is lost due to a reduction in the number of POM cells in the TCre-KO mutant. Although no changes in proliferation or apoptosis were observed in the POM at E11.5, Tbx1 is expressed in only a subset of cells in the POM and confining the analysis to Tbx1-expressing mesenchymal cells may reveal a proliferation defect in this tissue. Nevertheless, the completely penetrant cochlear phenotype observed in Brn4-;Tbx1+/- embryos together with the absence of detectable defects in Brn4+/-;Tbx1+/- embryos suggest that these genes act in parallel pathways. As previously mentioned, Shh secreted from the ventral midline regulates expression of Tbx1 in the POM, and Tbx1 is expressed in the ventral POM closest to the source of Shh (the notochord and floor plate). We hypothesize that Tbx1 functions in parallel with Brn4 to modulate gene expression in a critical subset of POM cells on the ventral border of the otic vesicle, and that interactions between these cells and the otic epithelium are necessary for proper cochlea formation (Fig. 7). Recently, a model was proposed in which Shh functions in two phases to regulate cochlear duct morphogenesis . In early development, Shh secreted from the ventral midline regulates patterning of the ventral otic vesicle by antagonizing the Gli3 repressor protein. In the later phase, Shh promotes outgrowth of the distal portion of the cochlear duct via recruitment of Gli activators. The cochlear defects seen in the mutants analyzed in this study indicate that Tbx1 and Brn4 likely act downstream of Shh in this second phase of development. Supporting this is the expression of mediators of Shh signaling, Ptc1, Gli1, Gli2 and Gli3, in the ventral POM . In addition, the forkhead box transcription factors Foxc1 and Foxc2 are known to directly activate Tbx1 expression in the POM by binding to an enhancer, downstream of Shh . This places these Fox genes downstream of Gli signaling but upstream of Tbx1. Model of Tbx1 and Brn4 function in the POM. 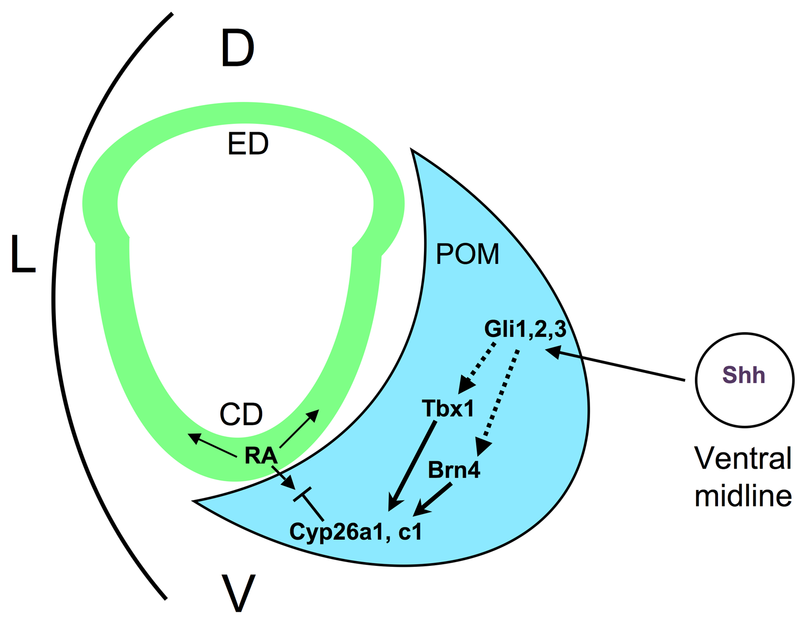 Sonic hedgehog (Shh) secreted from the notochord (circle) and floor plate regulates both Tbx1 and Brn4 in the POM (blue). This signal is likely mediated by Gli genes expressed in the POM. Tbx1 and Brn4 activate members of the Cyp26 family also expressed in the POM. These genes catabolize active retinoic acid (RA) secreted from the otic vesicle (green), thereby regulating RA activity in the POM. Brn4 regulates expression of Cyp26c1, while Tbx1 regulates both Cyp26a1 and Cyp26c1. Strict control of RA dosage in the POM is likely crucial for proper cochlear coiling. CD, cochlear duct; ED, endolymphatic duct; POM, periotic mesenchyme. Our data support a model in which Brn4 and Tbx1 act cooperatively on the same downstream target(s) to promote proper growth of the cochlear duct. Altered expression of Cyp26 genes in the POM of mutant embryos indicates that RA may be one of these targets (Fig. 7). In the ear, RA activity is regulated via metabolizing enzymes that are expressed in both the otic vesicle and the POM . Expression of the Raldh genes is mainly confined to the epithelium, while the Cyp26 genes localize to the mesenchyme . Expression of both Cyp26a1 and Cyp26c1 was altered in the POM at E10.5 and E11.5 in TCre-KO embryos, while Cyp26c1 was also reduced in Brn4-;Tbx1+/- embryos at E12.5. These data indicate that Tbx1, and to a lesser extent Brn4, are required to maintain expression of Cyp26a1 and Cyp26c1 in the POM during inner ear development. Loss of Tbx1 in the POM also caused a decrease in cell proliferation and an increase in apoptosis in the otic epithelium at E11.5. These defects were not localized to the ventral epithelium, but were instead observed throughout the entire otic vesicle. While unexpected, this result may be due to the diffusible nature of RA, and provides an explanation for the reduction in size seen in dissected otic vesicles of TCre-KO embryos at this stage. Alternatively, it could be due to normal cell movement within the tissue. Mouse mutants in which RA activity is increased during embryogenesis, either by null mutation of the Cyp26 genes or exposure to ectopic RA, display abnormal segmentation of the hindbrain [30–32]. Without the proper external cues emanating from this tissue, otic vesicle patterning and morphogenesis is abnormal . Because of these early defects, however, the function of RA at later stages of ear development is not as well understood. Ectopic RA activity due to decreased catabolization could lead to the cochlear malformations seen in TCre-KO and Brn4-;Tbx1+/- embryos via RA action on the otic vesicle, POM or both. Cyp26 enzymes expressed in the POM may function to inactivate excess RA produced by the epithelium, preventing abnormal regulation of RA target genes in the otic vesicle. Supporting this, adminstration of ectopic RA after otic specification is complete results in hypoplastic, malformed inner ears in both mouse and chick [34, 35]. In addition, genes important for cochlear development were shown to be inhibited by increased RA levels [36, 37]. It is also possible that genes in the POM are responsive to excess RA, leading to defects in remodeling around the growing cochlear duct and preventing proper cochlear coiling. This has been demonstrated by the inhibition of capsule chondrogenesis following RA treatment of cultured otic explants of mouse embryos . In summary, we have further described the genetic interaction between Tbx1 and Brn4 and shown that these genes regulate RA catabolizing genes in the POM during inner ear morphogenesis. Our results add to the evidence supporting a tissue non-autonomous role of the POM during development of the inner ear. Future studies will focus on gaining a better understanding of the relationship between Tbx1 and RA signaling in inner ear development, and identifying novel downstream targets of Tbx1 in the POM. The generation of the Tbx1 null allele and the Tbx1 flox allele have been previously described . T-Cre mice were obtained from Dr. Mark Lewandoski at the NIH  and crossed to ROSA26 reporter mice (Jackson) to analyze Cre activity. To generate T-Cre;Tbx1flox/- embryos (TCre-KO), T-Cre transgenic mice were crossed to Tbx1+/- mice on a mixed C57Bl6/Swiss Webster background to obtain T-Cre;Tbx1+/- mice. These mice were crossed to Tbx1flox/floxmice on a mixed genetic background. Tbx1+/- littermates were used as controls in all experiments. Mice were genotyped using primers to the Cre transgene (5' tcgatgcaacgagtgatgag 3' and 5' accaagtgacagcaatgctg 3') and the Tbx1 flox allele (5' tcttcttggggctgtagact 3' and 5' tgactgtgctgaagtgcatc 3'). To generate Brn4 and Tbx1 compound mutants, Brn4 hemizygous males or heterozygous females in a mixed genetic background were crossed to Tbx1+/- mice maintained on a C57BL/6 background . These offspring were intercrossed to obtain the following genotypes: Brn4+/-, Tbx1+/-, Brn4+/-;Tbx1+/-, Brn4-/- (or Brn4-), and Brn4-/-(Brn4-);Tbx1+/-. Embryos were isolated in cold PBS followed by fixation in 4% PFA overnight at 4°C, ethanol dehydration and embedding in paraffin wax. Seven μm thick sections were treated with either polyclonal rabbit Tbx1 antiserum (Zymed) 1:500, affinity-purified rabbit polyclonal anti-Brn4 antibodies 1:400, anti-cleaved Caspase 3 (R&D Systems) 1:1000, or anti-phospho-Histone 3 (Upstate) 1:200 in TBS/0.1% Triton X-100/5% goat serum/2%BSA. Sections were incubated for 1 h at room temperature and visualized with a biotinylated goat anti-rabbit IgG conjugate (1:200; DakoCytomation), avidin-biotin complex/HRP formation (DakoCytomation) and DAB/chromogen reaction (DakoCytomation). For histology, sections were stained with hematoxylin and eosin. Analysis of Tbx1 expression was performed using a full-length mRNA probe cloned by PCR into pCRII-TOPO (Invitrogen). A probe specific to the region deleted in Tbx1 conditional mutants was also generated and exhibited similar results. The remaining probes were either obtained as previously described  or generated as approximately 1 kb PCR fragments amplified from E13.5 mouse cDNA. All forward primers contained T3 polymerase priming sequence and all reverse primers contained T7 polymerase priming sequence. PCR products were purified by the PCR Purification Kit (Qiagen). Anti-sense RNA was in vitro transcribed and labeled with the T7 RNA polymerase (Roche) and DIG RNA Labeling Mix (Roche) using the Digoxigenin labeling method. Labeled RNA probes were purified by LiCl2 precipitation and re-suspended in 20 μl of RNAse-free water (Gibco). In situ hybridization was performed whole mount or on sections using standard methods as previously described . To generate histological sections following whole mount in situ hybridization, embryos were dehydrated through a graded ethanol series (70% EtOH for 5 minutes, 95% EtOH for 10 minutes, 2 times 100% EtOH for 5 minutes, 100% EtOH for 10 minutes, 2 times Xylene for 15 minutes), embedded in paraffin wax and sectioned at a thickness of 10 μm. Embryos were isolated at E15.5 in PBS, cut below the forelimbs and placed in Bodian fixative (5 ml glacial acetic acid, 5 ml 37% formaldehyde, 15 ml H20, 75 ml 100% EtOH) overnight at room temperature. Embryos were dehydrated in 100% ethanol overnight and cleared in methyl salicylate. Prior to injections, embryo heads were hemisected and the brain was removed. The inner ears were visualized by injecting 0.2% white Correction Fluid in methyl salicylate into the membranous labyrinth. The micropipette was inserted into the superior ampulla or the utricle depending on the ease of visualization of the lumen. Skeletal staining of E17.5 embryos was performed as previously described . Embryos were dissected and the skin removed followed by fixation in 100% EtOH overnight. Bone and cartilage were stained overnight with Alizarin red and Alcian blue, respectively. Loose tissue was removed by digestion in 2% KOH overnight, followed by destaining in 1% KOH/20% glycerol for 4–7 days. Embryos were transferred to 20% glycerol/20% EtOH overnight, followed by storage in 50% glycerol/50% EtOH. Evan M Braunstein, Dennis C Monks contributed equally to this work. This work is supported by the National Institutes of Health (DC05186-06) to B.E.M. E.M.B is supported by the Ruth L. Kirshstein National Research Service Award (DC008239-03). EMB designed and carried out the experiments, analyzed the results and drafted the manuscript. DCM carried out experiments, performed statistical analysis for the proliferation and apoptosis studies and aided with the in situ analysis of mutant embryos. VSA performed histological analysis of TCre-KO embryos and aided in analysis of the mutant phenotype. JSA generated the Tbx1 flox allele needed for creation of the TCre-KO mutant. BEM conceived, funded and supervised the project, which was carried out in her laboratory. Both EMB and BEM critically read and revised the manuscript. All authors have read and approved the final manuscript.